The Smart Cover for the iPad 2 is by far more advanced than the original iPad Case with its slim design, magnets, and an auto sleep mode. It’s crazy that the cover for the iPad 2 is as much a marvel as the device itself. I’m actually surprised Apple didn’t brand it with its logo. Yet the one area where the iPad Case beats the Smart Cover is in providing full protection for the iPad. The Smart Cover lacks a back. It’s easy to see why this is so, and until a third party vendor comes up with something, your options are limited. However, with a second cover and an X-Acto knife, you can have the best of both worlds. The TPU Thermoplastic Polyurethane Resin Skin Cover from Hand Held Items is a flexible, yet protective back cover. It’s advertised as a special type of material that won’t crack. That property can be used to combine it with the Smart Cover. 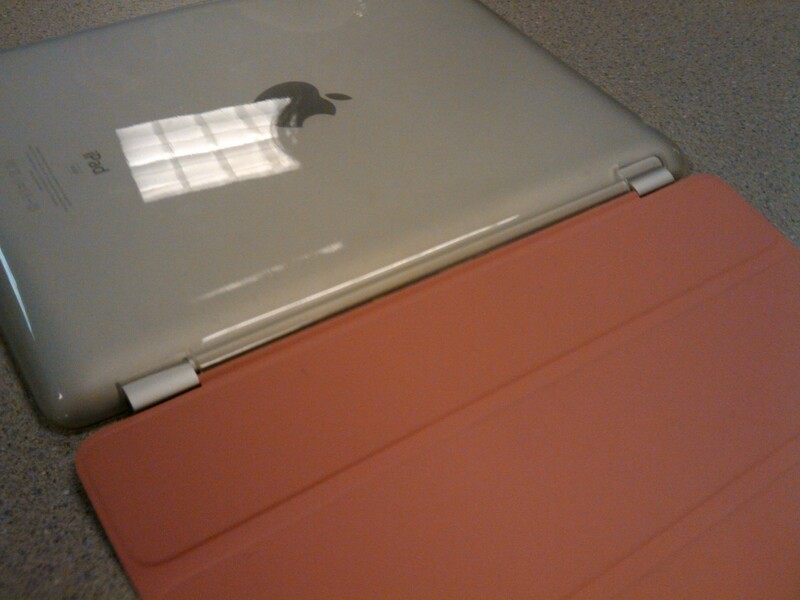 Once you have the TPU cover, place it on your iPad 2. Mark on it where the magnets of the Smart Cover will attach to the iPad’s left side. Then, using the X-Acto knife, cut out the marked lines. The top hole will be the easier of the two, since for some reason, there is already a hole there. Snap the Smart Cover on and check how it fits. Adjust as necessary. The beauty about this mod is that the Smart Cover’s functionality is not imposed upon at all. It still folds nicely for propping the iPad 2 and will put it to sleep when placed across the screen. The iPad 2’s slim design is not compromised at all with a bulky case. The only downside is that you might need to pull the Smart Cover’s edge slightly to make it perfectly line up with the iPad 2’s side (though that might not be the case with some fine tuning). For those wanting to mod the TPU even further, a standard hole punch tool will provide a nice opening for the iPad 2’s mic on top. The TPU comes in a variety of colors, though it looks like clear and a couple of other varieties are out of stock as of the publishing of this article. For $5.99, the price can’t be beat. Take fully protecting your iPad 2 into your own hands. Special thanks to Lorie Lee for the idea. I think Lorie Lee should work for Apple!